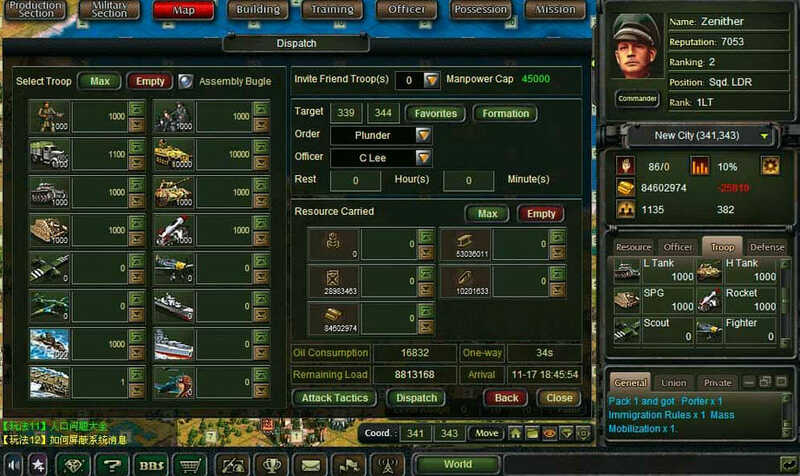 War2 Glory is free online strategy browser game set in the days of WW2 and immerses you into a world of building up your empire before going all out to conquer everything in your path. 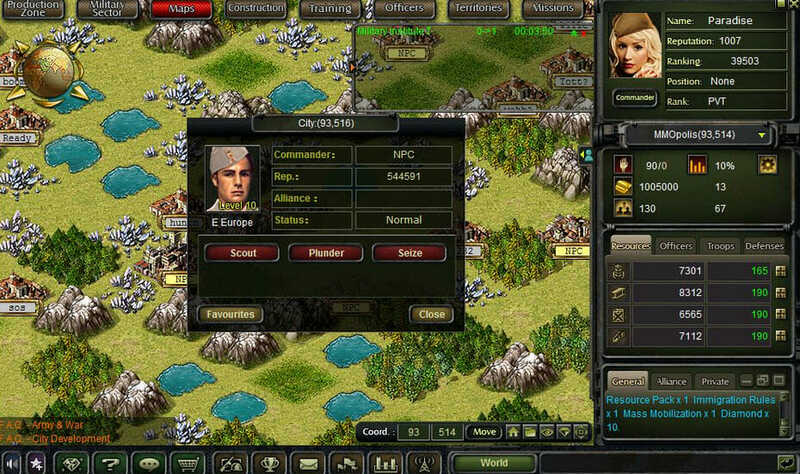 You as the player adopt the role of the commander in the faction of your choice. There are just two in this MMO and to be honest they are both fairly evenly matched with not too much difference in abilities. They are the Allied Forces, the good team and the Axis Powers who are obviously the bad team. 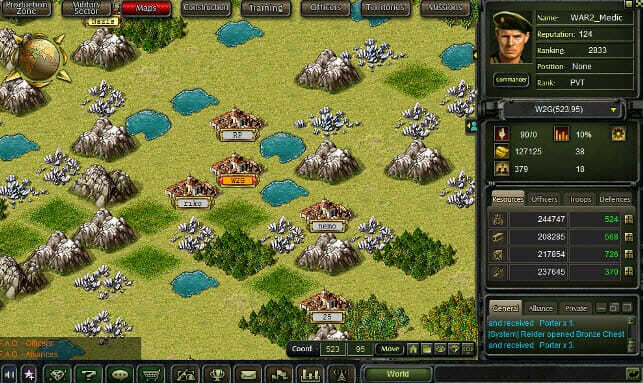 As is the case in others games like this you have to go about collecting the necessary resources to build your buildings, research, invent and create your army and weapons and increase your population. You are given a very clear tutorial to start with that helps you to learn just what you need to know to get started in the game. 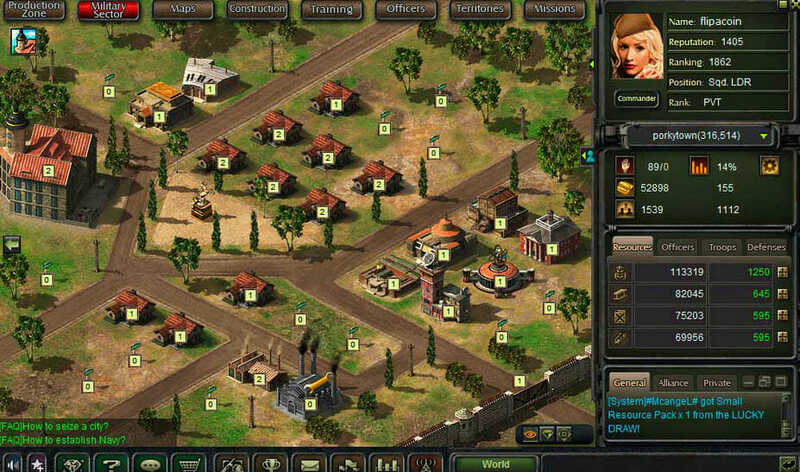 It will teach you how to build your first buildings, create your first soldiers and how to collect the valuable resources in the game. There are four resources in total whilst you are also able to earn gold in taxes from your townspeople. Another resource as such is that of your population and this is very important in the game. 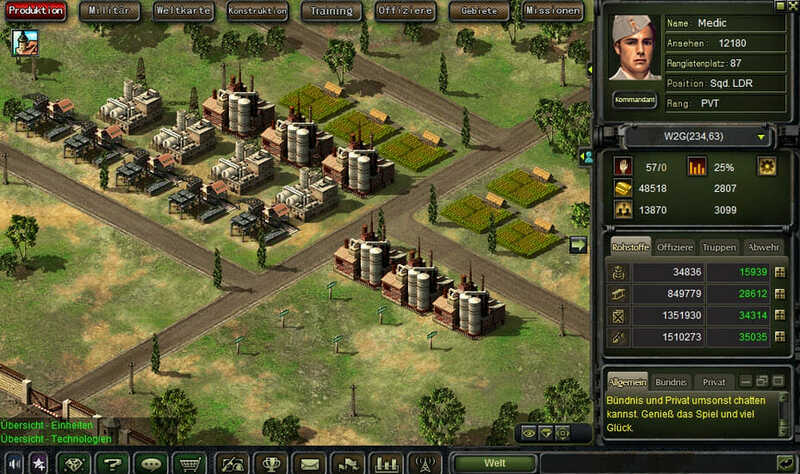 Your population not only brings you more money but also supplies you with the workers you need as well as recruits for your army. Whilst it may sound simple to keep gaining more population, that is just the start of it as you have to keep them happy. Your population can decrease if there are no houses, they are unhappy with the level of taxation or there is not enough food being produced in the town. As for the buildings that are on offer, there are plenty in the game that need to be constructed. A small number of these buildings are completely unique, meaning that you can only build them once. These buildings will give your town additional benefits. 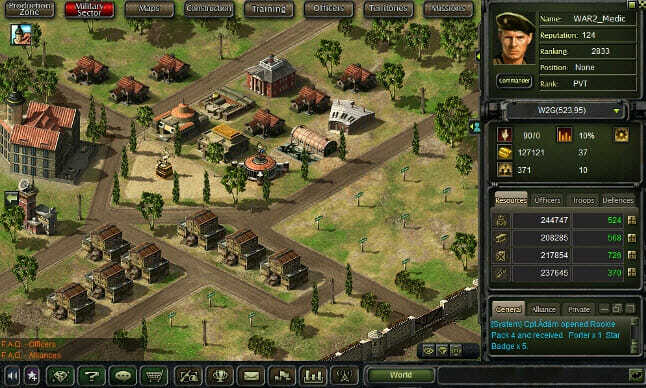 One of the buildings that is of utmost importance is that of the research centre as this is where you will be able to upgrade certain aspects of your town and army. 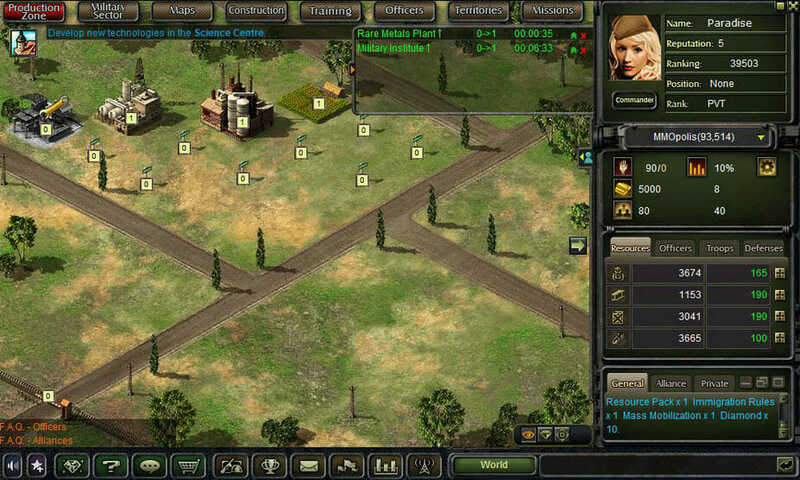 As is usually the case in strategy games like this, the building times are drawn out. Additionally, you can only construct two buildings at the same time so a large amount of planning is needed. This is where the game stands out as you have to have a good sense of balance and timing to be successful. All of these considerations and decisions may make the game feel a little complicated at the beginning but that really is the challenge. However, once you get going you will quickly learn the ropes and start to think a lot more tactically. There are quests for you to complete, NPC towns that you can try to conquer and there is a PvP mode that allows you to declare war on fellow players of the game. The latter is where the real fun comes in as once war is declared there is just a short time available for you to make the necessary preparations. Once you do attack another player you have the option to either just plunder the town for resources or go for the kill and conquer the town altogether. 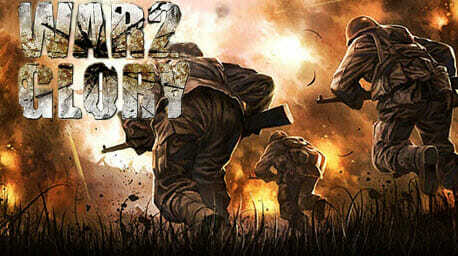 In summary, you get what you would expect from War 2 Glory. The graphics are what you would expect from a browser game, the waiting times and grinding are what you would expect and the end result is what you would expect. Good fun and certainly worth a try!